Istituto Svizzero in Milano presents the group show Inflected Objects #1: Abstraction – Rising Automated Reasoning, the first exhibition in a series of five dedicated to the crumbling concept of the digital and its effects on artistic production. This first chapter of an ongoing project is curated by Melanie Bühler, founder and curator of Lunch Bytes*, and Valerio Mannucci, co-founder and editor-in-chief of NERO. Inflected Objects #1: Abstraction – Rising Automated Reasoning examines how the digital can be approached now that it has – to quote the architect and writer Keller Easterling – “escaped the box” and merged with the deep structures of society. Computational processes can be traced everywhere and are deeply interwoven into the fabric of everyday routines. The digital can no longer be approached as a medium with distinct mechanisms and a specific aesthetic; rather, it is a pervasive force inflecting the materiality and representation of objects. Reflecting on the theme of abstraction and this techno-cultural condition more broadly, this exhibition brings together work of six European artists: Philippe Decrauzat (CH), Harm van den Dorpel (NL), Katharina Fengler (D/CH), Femke Herregraven (NL), Lars Holdhus (N) and Pierre Lumineau (CH). As more and more processes are digitized, the world is increasingly permeated by calculative, software-enabled infrastructures running silently in the background. As a result, we increasingly depend on these abstract processes that fly airplanes, switch on traffic lights, and determine the value of the money in bank accounts. the contemporary web are presently owned by a few private mega-companies, which capitalize on the content and data generated by the users of their platforms. Data exchanged at a rapid pace is gathered, profiled and put to work, so that more products can be sold. Social media profiles have become commodities whose exchange value is measured in likes, social capital and ultimately sold for hard cash. Never have we incorporated the logics of capitalism so intimately into our lives. The first exhibition in the series “Inflected Objects” titled “Abstraction – Rising Automated Reasoning,” analyzes the relation between the increasingly abstracted technological and economical flows that structure our lives and influence the material objects that surround us. It investigates how abstracted, computational and economical processes leak in, mingle, underlie and structure physical materiality. “Abstraction also Comes In Bars, Bodies, Grids, Sticks, Loops and automated Reasoning” writes Pierre Lumineau in the text he contributes to the exhibition. The six artists in Inflected Objects #1: Abstraction – Rising Automated Reasoning, are each represented with artworks that address different phenomena connected to the abstracted processes that structure today’s reality. The exhibition at Istituto Svizzero in Milano is accompanied by a website: www.inflected-objects.com. As a platform for the next chapters of the project, it also features additional commissioned artworks that are part of this first chapter dedicated to the theme of abstraction. It will start to evolve from the opening day of the exhibition and will gradually extend and accumulate content. Philippe Decrauzat (1974) lives in Lausanne where he teaches at ECAL and in 1999 founded the CIRCUIT Centre for Contemporary Art. He works with paintings, films, installations, drawings and sculptures, which often comprise geometrical compositions and combine multidisciplinary influences. 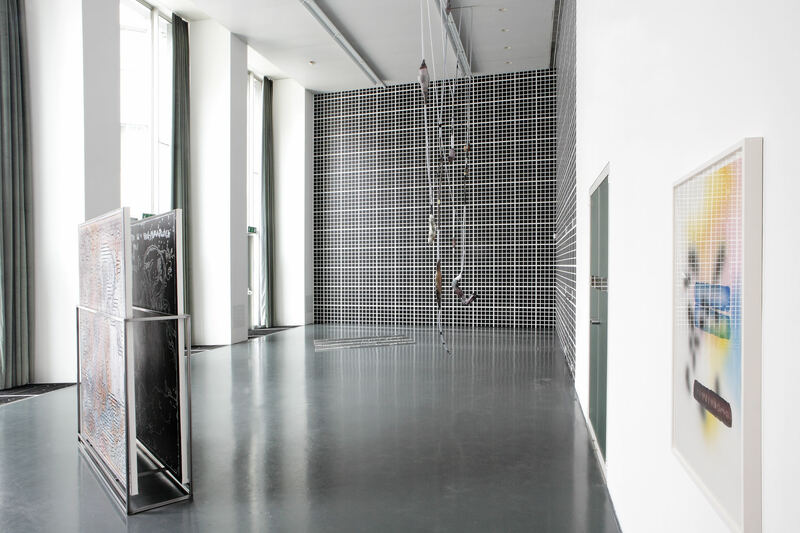 He has exhibited widely: in 2014 he presented NOTES, TONES, STONES at Le Magasin in Grenoble, in 2008 he had solo projects at the Bonner Kunstverein and at Secession, Vienna, in 2006 he showed Plate 28 at the Swiss Institute in New York. Harm van den Dorpel (1981) is an artist whose work presents self-programmed intuitive and associative information systems that reflect on the algorithmic and market-driven organization of popular social media platforms. He has exhibited at Abrons Art Center and American Medium, New York City, and in group exhibitions including Art Post- Internet, Ullens Center for Contemporary Art, Beijing, Image Employment, MoMA PS1, and Free at the New Museum, NYC. Katftarina Fengler (1980) studied Photography at Zurich University of the Arts. Her work deals with different aspects of psychology, perception and abstraction. Recent exhibitions include Friday at Autocenter, Berlin, One Bite NO SPACE @ OTHER Projects, Berlin, Space is the Place 2014, Basel. Femke Herregraven (1982) is an artist whose research traverses global finance, information and geopolitics. In her work she investigates which new material base, geographies and value systems are carved out by contemporary financial technologies and infrastructures. Her work has been presented at the Dark Ecology project, Serpentine Extinction Marathon and exhibited at T293 (Naples), Bureau Europa (Maastricht) and V&A (London). Lars Holdftus (1986) graduated from Städelschule, Frankfurt and Gerrit Rietveld Academie, Amsterdam. Central to his practice is how we can navigate new and increasingly complex technology-based scenarios. In his works he has been addressing tendencies in machine learning, AI and human interaction. Recent exhibitions include: Refraction. The image of sense at Blain Southern, London, Shattered Preface, OSL Contemporary, Oslo and LIQUIDATE at Sandy Brown, Berlin. Pierre Lumineau (1986) is a Swiss artist based in Zurich whose work focuses on writing and illustration, reflecting on themes like anonymity, artificiality and automatization as effects of software applications and digital platforms. He graduated from the Zurich University of the Arts in 2010 and his illustrations have appeared in the Post Internet Survival Guide 2010 (Revolver Publishing) by Katja Novitskova, on State, an online exhibition platform curated by Adam Cruces among others. Recent group shows include Brands – Concept/Affect/Modularity at S.A.L.T.S. in Birsfelden. * Luncft Bytes is a project on art and digital culture curated by Melanie Bühler initiated in 2011 and organized in collaboration with the Goethe-Institut Washington, The Hirshhorn Museum and Sculpture Garden, Washington DC and Pro Helvetia in Washington DC. In Europe it has collaborated with, among others, HKW, Berlin, Art Basel, CCA, Glasgow and ICA, London next to the Goethe-Institut as its main partner.